Introduce children to French through their love of coloring. Do you want your young child to develop a love of languages? Then make learning French fun by combining it with a favorite child's activity - coloring pictures! "Let's Learn French Coloring Book" introduces kids ages three to six to everyday French vocabulary using the same simple techniques that help children build vocabulary in their native language. Alphabetically organized from l'arbre (tree) to le zebre (zebra), these French "lessons" consist of delightful illustrations your child can bring to life with all the colors of the spectrum.While working crayons down to the nub, your child will learn eighty everyday words, such as the names of the seasons, animals, parts of the body, articles of clothing, and more. 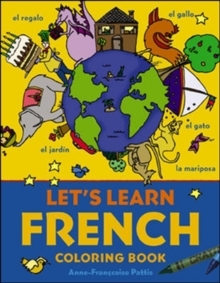 Other features include: culturally rich illustrations to introduce your child to the French lifestyle as well as the language; an illustrated review page allowing kids to check their own language recall; and, a glossary that includes the phonetic pronunciation of each word. Whether you're a teacher trying to foster a love of languages in your students or a parent who wants to get a head start on language study, this charming book is great resource for imaginative, active language learning.